Ok, this is my first tutorial! Hope you enjoy it! 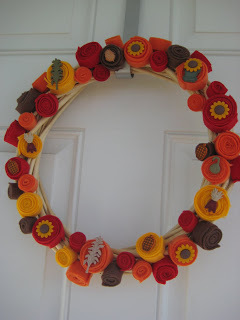 So I was inspired to make my own fall wreath because I have plenty of inside decor but nothing for the door! And I saw Mandy’s tutorial on how to do one of these too. I just changed some stuff to make it my own (mandysyellowcorner.blogspot.com). Part of making my own things is to save MONEY also! Well I think I was successful on this one. I saw wreaths you could buy at Hobby Lobby, Joann Fabric, and Michaels but they were all like 20-50 dollars. YIKES! Well I was able to make my own for, guess….less than $3.00 dollars! Yipee!! 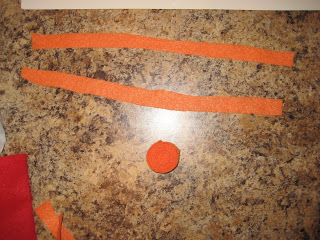 I got the wreath from the dollar store and bought the felt from Hobby Lobby for 25 cents a sheet. Now that’s a good deal. Ok so I had felt sheets and I cut them into strips. 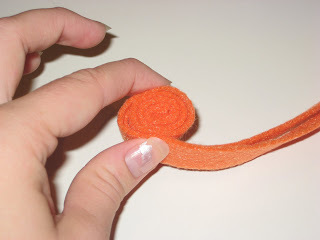 For a small “ball” use one strip like this. Then use a hot glue gun to glue the end. Sorry I didn’t do the best with taking pics of all the materials first!! 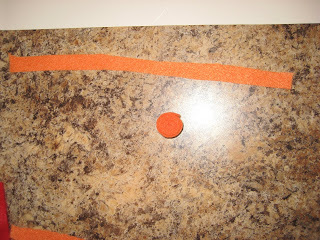 If you want a bigger one then use 2 strips of felt and roll them together. Even bigger, go with 3 strips. This is how you roll them. 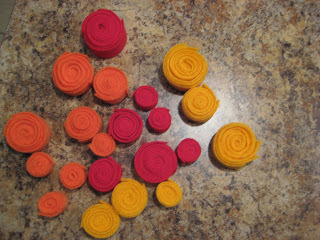 Here are the different sizes of the felt pieces. I ended up going and buying 3 more pieces of felt because I didn’t have enough. So I used a total of 6 sheets. I got brown the second time instead of yellow. After I finished all of them, I glued them all over the wreath spacing out colors and sizes. Then my friend Tiree had bought these buttons that have fall things on them…like sunflowers, pumpkins, leaves, etc and I glued those onto some of these roll-up pieces of felt. So here is a picture of my final piece of work hung on our front door! I bought the hanging piece at the dollar store too!